Drama is Back at KPAC! 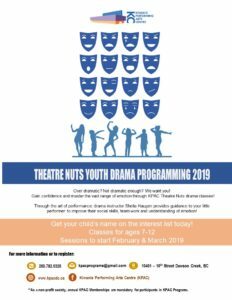 KPAC is excited to offer youth drama classes with Sheila Haugen again! Contact the office to get your child’s name on an interest list for classes 250.782.9325. The goal is to have some classes starting after school in February and during March spring break. Are you and adult wanting drama classes? Give us a call! We are currently taking an interest list for this as well and will organize some classes once we have enough to run a program. **For programs to run, we require a minimum of 5 participants registered.